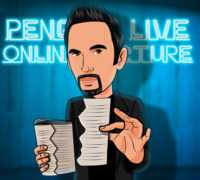 Today, when you order "Steve Valentine LIVE", you'll instantly be emailed a Penguin Magic gift certificate. You can spend it on anything you like at Penguin, just like cash. Just complete your order as normal, and within seconds you'll get an email with your gift certificate. 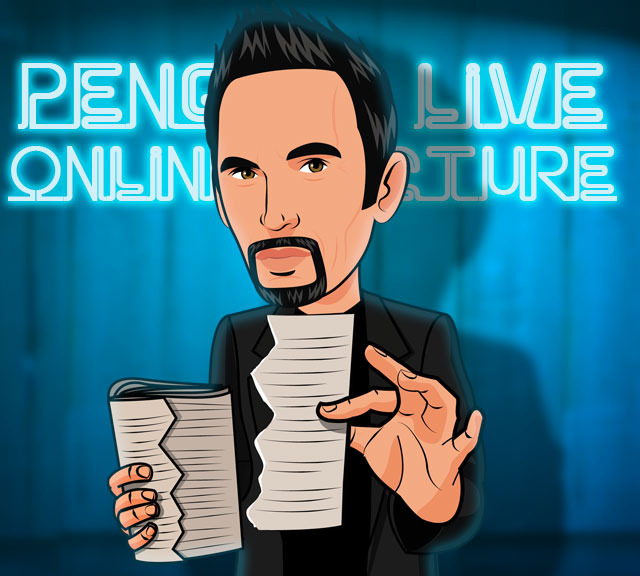 Typically, when I tell you what to expect from a Penguin Live lecture, I try to give a relatively thorough overview of everything taught. That isn't going to happen with this description of Steve Valentine's lecture, because he has literally packed more magic into it than I've ever seen. He starts by repeatedly getting me to select the same card, showing some flourishy cuts, changing the wrong card to the right one, and vanishing the deck while his wrists are held, leaving only my chosen card behind. Then, he shares a nice touch on producing a wine glass, goes on to produce a giant diamond from a spread of cards, and demonstrates how the technique may be used to produce other objects. Next, Steve shares his work on the Classic Force (and he's awesome at it). Then he shows a simple technique (based on Max Malini) to vanish a deck. Following that, he teaches a terrific Smash and Grab trick through a sheet of newspaper, perfect to perform with a deck unsuited for anything else. Then, Steve shows a complete self-working routine where he can tell me at what number my card will be found, I find another card in a random way, and an unseen card causes every card matching its suit to remain face-up as the rest of the deck rights itself. And it quickly resets. Taking the idea of a fully set-up deck even further, Steve makes a peeked at card jump up from the deck. But, it's wrong... or is it? Then, the color of a selected card's back changes to red, the whole deck becomes red, a single thought-of card remains blue, momentarily, then it's red. And, three blue-backed jokers trap two red-backed cards, which vanish. The jokers are dropped on the deck & one of them pops inside to find the two cards. Then, an odd-backed prediction matches any selected card, and two cards placed face-to-face fuse into one strange card with two backs. Whew! What I've just described is only the first hour of Steve Valentine's incredible lecture. Yes, Steve Valentine is fast, funny, and endlessly entertaining. Do yourself (and your magic) a huge favor and watch this now. 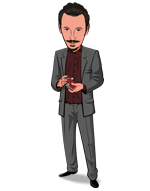 Born in Scotland, raised near London, Steve Valentine has been performing since age 5. That was the year he started theatre and dance training and took a passionate, life long interest in magic. A long-time board member at the Magic Castle and The Academy Of Magical Arts, Steve has performed stand-up in Las Vegas at the Riviera and Harrah's Hotels and at Hollywood’s world famous Magic Castle, where he was awarded the coveted Close-up Magician of the Year two years in a row! In the past he's traveled the world performing in almost every country from Alaska to The Falklands to India. With over 250 hours of TV and Film to his credit, Steve is best known for his series regular roles on Crossing Jordan, I'm in the Band, Estate of Panic and Nikki. Teens around the world will also know him from his starring roles in Disney's Avalon High, Teen Beach Movie, Wizards of Waverly Place Movie and Don't Look Under the Bed. Aside from acting, he is also an incredible writer, performer and magician. Steve recently developed a series about Harry Houdini with NBC. Whether he is creating mind blowing magic tricks for professional magicians, playing multiple roles in film and television, writing graphic novels, winning Lecturer of the Year at the world famous Magic Castle in Hollywood, or performing his one man show Naked with a Deck of Cards, Steve Valentine knows how to entertain a crowd. This is how all lectures should be. As others have stated, the explanations are to the point and not overly done. If there was anything that needed to be clarified, Dan would see it and ask. You can always go back and check out what you may have missed during the live lecture. Great effects and a load of bits of business. synonyms supreme, superb, superlative, superior, accomplished, expert, proficient, skillful, skilled, masterly, master, first-class, talented, gifted, polished, practiced, perfect, ultimate;What else can be expounded upon ?get this download immediately trust me this guy is Bad ! This lecture is just amazing. Steve gives you a ton of material that you'll be watching again and again. Not only that, he gives some great insight on performing and tips on presentation as well. His "self working" routine where Dan does most of the work was brilliant and is definitely the effect you want to do after-dinner when someone asks you to show them something. Steve is incredibly entertaining to watch as well. He seems to genuinely be enjoying himself and explains everything perfectly. I have a lot of PM lectures, and most are really good stuff, but this one has taken the top spot in my collection as far as material I walked away with that I will actually use. this is the exact representation of a pro. anyone will learn a lot from watching this guy's lecture. steve have lots of very creative ideas and many very cool way to achieve stunning magic with technics that works in from of real people. he tested them himself. watch and learn.... a lot! I always learn something new about presentation and routining from Steve Valentine from his wonderful DVDs and the Penguin Live lecture is no exception. LOTS of great ideas and usable material from a true pro. My only nit is that the lecture is 95% card stuff, which is great for card enthusiasts, not so great for the rest of us. Still, highly recommended. I love close up and cards and for me this was an fantastic lecture! So much practical things, so much fun and deep knowledge about all things and with so much power and energy! For me I would say "The OSCAR for the perfect lecture goes to....STEVE VALENTINE!!!!" This lecture is jam packed with material. He vanishes the deck over and over, in front of magicians, so you know his methods are practical. If he didn't teach you how to do the deck vanish, his teaching on the Classic Force is enough to make the lecture worth it. Steve has some gusto with this move, and he really teaches the nuances of making it work over and over until people hate you! I mean if this lecture alone doesn't give the average card worker enough material to make his head spin, you're not watching closely enough! I am not great at writing long detailed reviews but i feel i do have to say how great this lecture was. Steve is a very entertaining and funny guy and is a great teacher as well. However if you hate card tricks this probably is not the lecture for you. Fantastic solid material. I do not recommend this for beginners as Valentine takes advantage of the fact you can download, pause and rewind, to get through as much material as possible and beginners may wish for more detail on certain things. But if you feel competent with a deck of cards, buy this lecture. I'll just add to what everyone else said, this is one to get. You'll learn and be entertained in the process.